A new trend that has been finding its way onto the surface of garage floors and shop floors is the use of a concrete densifier and sealer. Densifiers have been used on occasion in the garage for a variety of reasons, but rarely as an actual finished garage flooring treatment. So why has there been a gradual increase in its use and popularity for the garage floor? The reason is the addition of silicone and siliconate agents in some densifiers to act as a sealer. This helps to create not only a water repellant floor, but one that is resistant to liquids and chemicals in general. So let’s take a closer look at how a concrete densifier with sealer on your garage floor may be beneficial for you. Concrete densifiers have been around for decades. They are a concrete hardener that have been used in the flooring industry primarily for concrete floor polishing, increased abrasion resistance, anti-dusting, and moisture mitigation. In some cases it is used to harden softer concrete surfaces before grinding. They are typically applied to machine troweled, hard troweled, and smooth concrete. When concrete cures, bleed water makes its way to the surface and increases the water to cement ratio. The result is an increase in laitance content, and fine aggregates. This is what helps to make the surface of concrete smooth, but it also creates a surface that is softer than the underlying cement. When a densifier is introduced, a chemical reaction is created that increases the surface strength of concrete from an average of 20% to 40% depending on the original pour and finish of the concrete. Densifiers are a water based chemical solution that first works by penetrating into the surface of the concrete and reacting with calcium hydroxide to produce calcium silicate hydrate (CSH). This is the substance that gives concrete its strength. Next, the CSH that is produced fills the open pores and capillaries of the concrete, thus increasing the density and strength. Lithium densifiers are the most common choice used for garage floors. This is due to their ease of application and less reactive properties to carbon dioxide which can create a whitening effect on the floor. Unlike sodium densifiers, lithium densifiers also do a good job at repelling road salts. Once applied, the concrete retains its natural matte look. It’s important to note that concrete densifiers are non-film forming, meaning that they don’t leave a topical film on the surface to protect it from liquids and staining. Densifiers are technically not a water repelling sealer as well. They don’t form a molecular membrane at the surface that repels liquids. This is why they haven’t been used much as a finished product for garage floors – until recently. The addition of silicone and siliconate agents in densifiers has changed this. They create a waterproofing agent right at the sub-surface of the concrete. This addition allows the densifier to act as a sealer for your garage floor by repelling water, oils, chemicals such as road salts, and other fluids. Are they 100% impervious to stains and chemicals? No, but if you don’t allow spills to sit for a long period, they will generally wipe right up with little if any scrubbing necessary. Be particularly careful with solvents that can stain, as their resistance to them is minimal. One particular densifier sealer that we recommend is PS104 by Concrete Sealers USA. This is the same company that manufacturers the very highly rated PS101 siliconate sealer which we have discussed before. With an average coverage rate of 200-300ft², it is now available in 1 gallon containers as well as their 5 gallon containers. What we like about PS104 is the amount of lithium silicate (measured in solids content) that is used. Manufacturers generally have to perform a balancing act between how much lithium silicate can be included for densifying purposes and how much siliconate can be added for sealing the surface. If too much lithium silicate is used, it makes it difficult to add the required amount of siliconate for sealing. It also makes the product more expensive. As a result, many of the densifiers with siliconate sealer added have a lower solids content of the lithium silicate in order to keep the price point down and manufacturing of the product easier. The results, however, are less effective densifying properties. 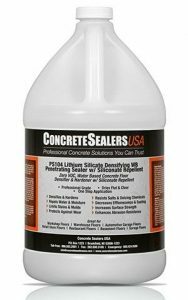 Concrete Sealers USA has found a way to use almost the same amount of lithium silicate in their PS104 as they do in their standard densifier. As a result, you can expect close to the similar densifying performance as a straight densifier as well as the added benefit of the siliconate sealer. The application of a densifier sealer for your garage floor couldn’t be much easier. You first need to make sure your garage floor is clean and free of all dust, oils, and foreign contaminants. Any stains that you have will essentially be locked in unless removed first. The surface must be completely dry before applying the product. The easiest way to apply the densifier is to use a garden sprayer with a circular spray tip or a microfiber mop out of a paint tray. Work in sections making sure to keep a wet edge at all times. You want to get the concrete wet with product, but not so much that it puddles. If it does puddle, work it into the concrete with a short bristled deck brush or wipe up the excess. If you allow the puddles to dry, you will get a white residue that requires intense scrubbing to remove. Once applied, you can return the floor to traffic within a couple of hours or so. One application is generally all that is required. One note to make is that if you plan on adding a topical coating at some point in the future, you will need to grind the concrete in order to remove the sealer and provide a mechanical bond for the coating. Acid etching will not work because the etching solution will not be allowed to penetrate the surface sufficiently in order to react with the concrete. If you like the look of bare concrete and have a working garage or shop floor that you want to protect without making a big project out of it, then a concrete densifier sealer can be a good solution for you. It’s easy to apply, relatively inexpensive, and will provide years of protection for your concrete. I have purchased Armor L3000 to harden my floor before applying an Epoxy top coat. I had planned to grind my floor and then use L3000, but I have been told that I should apply L3000 before mechanically grinding the floor as the L3000 would seal the pores in the concrete and make it hard for the epoxy to grab hold. This seems counter intuitive as this would either grind off the L3000 (assuming it only seeps 1/4 inch or less below the surface), or it would still leave pores filled at the sub surface even after grinding (assuming it seeps below a 1/4 inch of the surface, which is what I would expect it to do). Assuming I would only be applying 1 coat and not allowing puddles to form, am I really better off one way or the other? Hello E1. Applying a densifier first then grinding is standard procedure for floors treated before a coating is applied. Though a densifier penetrates the concrete, it would effectively reduce or help to smooth the mechanical profile of concrete that has already been ground, thus reducing the most effective adhesion of your epoxy and increasing the chances of delamination. It does this by filling the open pores (which you just exposed) and some of the mechanical profile (from grinding) with calcium silicate hydrate. The effects of a densifier will typically penetrate deeper than 1/4″. It’s a reactive sealer that takes about a week to go through it’s full process. Also, grinding will only be removing about 1/64″ of the concrete surface. Grinding after application puts a fresh profile to the surface that will allow the epoxy to mechanically adhere to. Thanks for the insight, the Armor guys said a similar thing and because the densifier smoothes out the profile it makes sense to grind after words. Just as a note, the Armor guys said L3000, depending on porosity of the concrete, will penetrate any where from 3/8″ to 6″. I have a new garage slab and am planning to do a porcelain tile floor eventually but need to put it off for a year or two. Would a densifier / sealer product like L3000 or PS104 be a good choice in the interim to help resist staining and decrease white dust? Would those products require grinding before a tile floor could be laid on top? Thanks! Hello Tom. Any sealer that is applied to the concrete prior to installation of tile will need to be ground off the surface or the mortar will not adhere well. L3000 densifier by Foundation Armor is stand alone densifier while PS104 by Concrete Sealers USA is a densifier with siliconate sealer added. A stand alone densifier technically does not seal the concrete. It hardens the concrete which can have a “sealing effect” since the reaction of the densifier fills many of the open capillaries with calcium silicate hydrate. It does not form a membrane at the subsurface like a sealer does. If you used a stand alone densifier you may or may not need to grind. It depends on how dense your current surface is already and how much moisture the surface will absorb when it comes time to tile a year or two down the road. Unfortunately, there is no definitive answer to your question if you use a straight densifier. I read lots of these comments…haven’t made it through all (yet). I had a slab poured in May 2017 with an admixture for water repellancy (Rheomix 235 on ticket). We built a shop on it this past summer and fall. Now preparing to clean seal the floors and then seal the sawcuts with backer/self leveling sealer. Will the admixture prevent a densifier/sealer such as PS104 from working as intended? This will be used as an hobby auto shop. Thanks in advance. Hello Inger. As long as the slab will still absorb water and not bead, you will be able to use such a sealer without additional concrete surface prep other than cleaning. 1. What’s a good densifier to choose? 2. How long should I wait before applying the densifier? 3. It’s November now, and cool. What difference does that make?? Hello up-on-two. We recommend the use of a lithium silicate densifier. They are more effective and easier to apply than the older formulated sodium silicate densifiers. You need to wait at least 30 days for the concrete to cure (assuming a 4″ pour) before application. Temps during application typically need to be 40 degrees or higher. 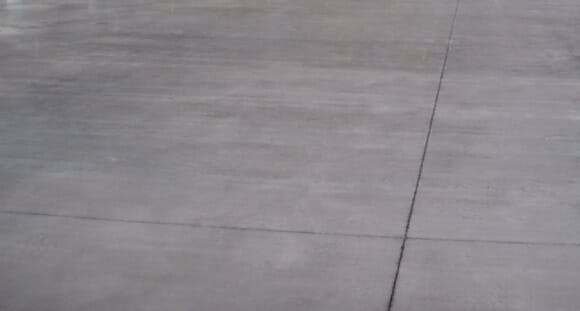 In terms of product, we know that Concrete Sealers USA turns out some very good densifiers. They use some of the highest concentration of solids. If you want a densifier with the added siliconate sealer to seal the surface, then no one that we know of has a better product than their PS104. If you want to use just a straight densifier without sealer added, the that would be their PS103. Foundation Armor also has a good straight densifier which we tested and wrote about here. Thanks for your help. I had a 6” pour with rebar and microfiber. Will that require a longer cure time before adding the densifier? Yes. Typically you will add a couple more weeks for the majority of the moisture to work its way out. Excellent! Many thanks. I’ll give it plenty of time to cure and dry. Hi, i have a high traffic residential garage floor – 2 cars, bikes, etc. as well as the main entry to the house. Always had a problem with concrete dust and several years ago applied a rust-o-leum 2 part epoxy floor coating. Followed the directions to a T, looked great but was completely up within 2 years. I am thinking that I should be sealed, but not sure if a densifier or a MMA sealer is better to solve the dust problem. I would like to add a dye to the sealer, and if a densifier is the best option, can a dye be used. Looks like it can be used with a MMA sealer. Hello tspain. A dye cannot be used with a densifier. It is a penetrating sealer that is designed to penetrate the surface of the concrete. Additionally, dyes need to be coated with a clear sealer in order to make the color wet out and pop. If a dye is not coated, it will look dull and unattractive. We do have an important question before we can answer the rest of your questions. When the Rust-Oleum epoxy came up, did it have white residue on the back of the coating or was it fairly clean? Good question, it has been more than a couple of years and it flaked of so the pieces were small. The dust however was prevalent in the area ls where it came up first so I assume ls it was efflorescence. Not sure if this answers the question. Might the issue be something else? OK, this raises another issue. Efflorescence is caused by moisture, not dusting. If you have moisture issues then that would be why the coating came up. Have you done a moisture test during the wet periods of the year? Also, has the coating been completely removed and if so, how? I equated efflorescence with the white dust that i have been experiencing and could be mistaken. I did try a moisture test – taped a small sheet of clear plastic to the floor and did not find any moisture on the plastic the following day; however the dust prevented the tape from sticking for any lengthy period of time i am sure. The coating is completely gone from most of the garage floor. There are areas where the coating is still visible on the perimeter of the floor, beneath some wall shelving and on portions of the 2 foot or so high wall that surrounds the floor. There is a significant amount of moisture in the garage particularly in the winter months when there is snow melt from the vehicles, garden tools and a gas grill that has been replaced have become rusty. If your coating came up just about everywhere on its own, then you most likely have a serious dusting issue that is going to require some thought on your part on how much you want to address it. Can you create a shallow groove in the concrete with a sharp screwdriver? If so, then your dusting problem is serious. This article about dusting explains why it happens. Applying another coating (MMA acrylic sealer for example) is not going to solve the problem as it will eventually come up like the epoxy did. The easiest option would be to clean the concrete well and then apply a densifier with sealer added just like the one we discuss in this article. It will not completely stop a serious dusting issue, but it will dramatically reduce it. The second option would be to grind the concrete and apply a commercial quality coating. A good grind is going to remove the weak layer of concrete that causes the dusting and allow a good coating to adhere like it should. If this is more than you feel comfortable tackling yourself, our advice would be to contact a commercial garage floor coating company. Most will come to your residence, inspect the concrete surface, and give you a free quote. Plus, it will give you a better idea of the shape of your concrete surface. Can you paint a two part epoxy over a concrete densifier on a garage floor? Hello Leroy. For most applications you cannot do this without first grinding the concrete. The densifier prohibits a good acid etch and also prevents a coating from penetrating very well. The one exception is for some of the low solids DIY store bought kits such as EpoxyShield and etc. Sometimes they state you can apply a densifier to the concrete after it has been etched first if there is concern about moisture. You can then apply their coating thereafter. However, it is not recommended at all for higher solids, higher performing coatings. You must grind first.